No you don’t have to have either Windows or Mac in order to update your Garmin Nuvi GPS (or Magellan, TomTom, and a few others). And no, you don’t have to pay for updated maps either, even if your GPS is older or unregistered with the company. I did it, and I’m still as technophobic as I ever was. So if this li’l technophobic sidekick can manage it, it’s likely that any of my readers can. I do the FedEx Ground delivery driver thing, and I have an old hand-me-down Garmin Nuvi that I use on my route. Not for directions, but just as a “rolling map” to tell me where I am and streets are coming up as I travel. The technique I’ll show you here uses OpenStreetMap, a free and open-source collaborative work. Maps are updated much more often than the official Garmin maps. They also show considerably more detail, judging by my Nuvi’s performance today. I’m just going to write about the Garmin GPS because that’s what I have and all I really know. But according to this wonderful web page, it also works for some other brands. I navigated to my /home directory and created a new folder named “GarminNuvi.” It has a subfolder called Maps. I connected my Garmin Nuvi to my computer via a USB port and it was automagically mounted, thanks to Thunar’s awesomeness (Thunar is the Xfce file manager in Linux). I then copied the map file, named gmapprom.img, to /home/robin/GarminNuvi/Map. You can do this in the terminal or just open your file manager as root (“sudo thunar” in a terminal window) and move the file from your Garmin to the “Map” subfolder. This is a safety thing! ALWAYS BACK UP the old map in case something goes wrong! Now you can DELETE gmapprom.img from the Garmin. I renamed this backup file gmapprom-old.img. If I needed to restore it, I’d give it back it’s original name. Select and download the new maps from http://garmin.openstreetmap.nl/ It’s easy, just follow the prompts on the screen to select your map by continent, country, state, province, or customize your own. If you customize yours, you’ll need to enter your e-mail address and they’ll notify you when it’s compiled and ready to download. My old map is North America, nearly 3GB in size! Yikes! So I selected only my own state for the new map, because that’s really all I need and it’s just a few hundred MB in size. Easy peasy. And fast! 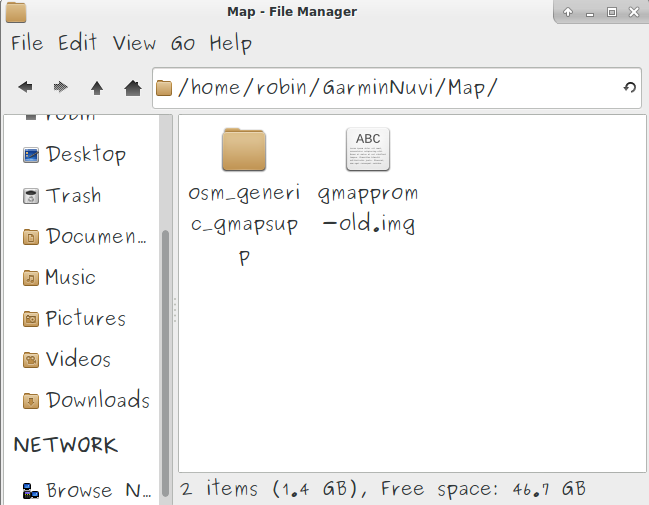 The file you want for the Garmin Nuvi is named osm_generic_gmapsupp.zip. Move that file to /Garmin/New and extract it there. 7-zip works, most default "archivers" work for decompressing zip files. After unzipping it, you'll have a file called gmapsupp.img. For the Garmin, you must rename that file to gmapprom.img. This is your new map! Copy it back to your Garmin, re-start it, and take it for a test drive. Save a copy of your new gmapprom.img in the /Garmin/New folder as the next backup. When it's time, that can be moved to the Old subfolder. But until you're sure everything works okay, keep that old one around! Looks complicated but I’ll go look for my old patch cable and give it a go . Did it work?? For me it did not!! I downloaded and transfered the map OK, but when I search, I cant find a bunch of adresses!! It doesnt even have my street name listed!! (and it’s not a new street; its been there for 25 years). It surely does lose a few features… and I don’t think PpenMaps are nearly as accurate. This is the second time I have considered deleting this post, for just what you have described. I have a old Nuvi 750 that is in my daughter’s Nissan Sentra S. It’s from 2008. I found new Garmin maps (via torrents) and would try to use the SD card and put in img file gmapsupp on the SD card and the Nuvi wouldn’t see it, until I did this. Install SD or Micro SD card (with adapter, so it will fit) into unit. And under your unit is a subfolder called Nuvi 750 with a drive letter associated with it. This is your SD card. Right click your SD card and choose properties and format. Quick Format Fat 32. Now go download your map files and put them in that drive. Make a Garmin folder and the map name has to be gmapsupp.img for the Garmin unit to recognize it as a map file. I hope this helped. I was having a hard time getting the Garmin unit to see the files, until I formatted the SD card via the Nuvi itself. Your information of updating NUVI maps seems very useful. Your blog contains all required content that need to update your device. Keep sharing more information with us. Or if you want to update your NUVI contact us to our customer support helpline 1800-443-3536 (toll free). We are 24*7 hours available. Does the Map app work with Voice navigation as well? I have no idea! I never used voice navigation. But I would guess probably not. 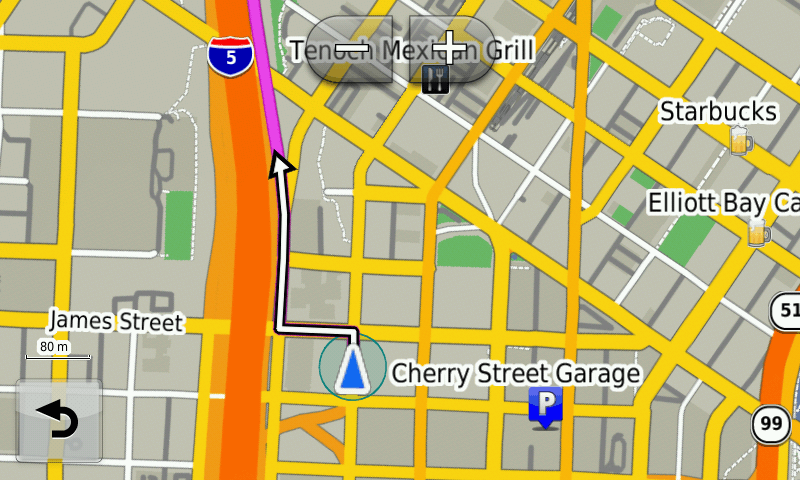 That’s a great piece of information about Update Garmin Nuvi Maps-for-free. Please do keep me posted on any further updates on this article. Thanks! My Garmin Nuvi 255w covers the entire US. The map in the Garmin is only 1.3 gig. I would like to update it but can not figure out how to download the entire US from openstreetmap. I have tried to select individual states in openstreetmap but it only allows one to be downloaded at a time. I only needed two states to be loaded in my Garmin. I’m not sure how to get a nationwide Open Street map for download. I downloaded only what I needed. These updates are not the same as the custom Garmin supplied maps. Garmin adds more info to it for auto navigation to work correctly. There may even be a type of database structure to it so it all works correctly with addresses, Point Of Interest, etc, with the map.